What Kind of China-UK Relationship Do We Need? I am delighted to visit Durham University. As the third oldest university in England, you have long and distinguished history. Not long ago, I attended the celebration of the centenary of Hong Kong University. Then I said 'a one-hundred-year old university is still quite young' because I know some British universities have a history of hundreds of years. I have learned that teaching activities in Durham University started about 600 years ago. It has been formally established as a university for 180 years. But age has far from dulling your progress! I believe a measure of your vitality is your new membership of the Russell Group. I warmly congratulate you on joining this elite group. Durham is now the 12th member of the Russell Group I have visited. This is my first visit to Durham University, yet Durham University is no stranger to me, because it has often been in the news for its links with China. Two years ago when I first became Chinese Ambassador to the UK, I read about Durham closing its East Asian Department and suspending the Chinese language major for a Bachelor degree. I was sad when I learned about these decisions because Durham has a high reputation for its strengths in Oriental languages and studies. Last year I heard Durham would resume Chinese language programmes for undergraduates. That was an exciting piece of news. I believe this is a very wise reorganization. The change shows that Durham University is back in tune with global trends. 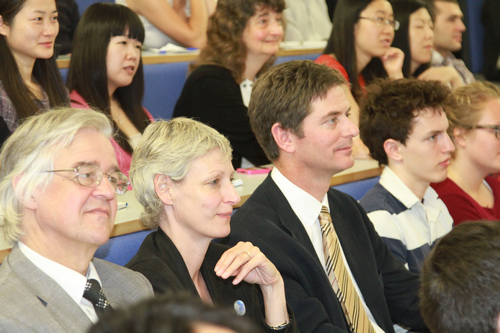 It is a recognition that learning Mandarin provides great advantages to British students. Mandarin language skills will open immense career opportunities as China retakes its place as a leading nation of the world. There is another reason why Durham is no stranger to me. I was once invited to speak at a function hosted by the Chopsticks Club. As its name suggests, this is a private members dining club, a club that always holds events in Chinese restaurants. It is committed to China-related knowledge sharing and cultural exchange, and of course enjoying Chinese food! Its predecessor was an organization called China Tuesdays, which was founded in 1993 by some young people from Durham University. In that spirit of study of China I will now respond to a kind invitation from Vice-Chancellor Higgins. He proposed that today I speak about China's foreign policy. This year marks forty years of full diplomatic relations between China and UK. We now have close exchanges and cooperation between our two countries. This would have been unimaginable for people four decades ago. · And High-level People-To-People Dialogue. · We have put in place dozens of other bilateral dialogue and consultations mechanisms. · We now have 47 pairs of friendship cities and provinces. · In 1972, China-UK trade was merely 300 million US dollars. · Last year this surged to 58.7 billion US dollars. This is an increase of more than 200 times. · Last year, more than 370,000 people visited UK. This number is almost 2,000 times of that in 1972. Progress in China-UK relations is an indisputable fact. Yet, we also need to be aware that development of our relations in these forty years has not been plain sailing. We went through ups and downs. Taiwan, Hong Kong, Tibet, human rights used to be touchy issues. They still crop up from time to time and hold back greater advance in our relations. In addition our relations still lack balance. There is the challenge of deficits. Between China and UK, there is not only a trade deficit, but also a deficit of understanding. We need to work much harder to strengthen not only mutual benefit but also mutual trust. We must succeed in achieving these goals because we now live in a different world. Global relations are very different from 40 years ago when we established full diplomatic links. The world today is not one of hegemony, but of globalization and multi-polarity. It no longer features a 'cold war' between the West and the East. We now aim for peaceful coexistence and win-win cooperation. In such a world, what kind of relationship do we need between UK and China? How do we ensure healthy and stable development of our relations and avoid ups and downs when we have differences? Britain is the world's oldest capitalist country and has long been fully developed. China is a socialist country committed to its own development path. China is also the largest developing country in the world. The first principle is political mutual respect. From mutual respect comes mutual trust. Respect is the basis for cooperation. In the case of China and UK, several factors merit our attention. A key step is to respect the fact that we are in different development stages. Britain is where the European industrial revolution started. The UK is the earliest advanced industrialised country in the world. After centuries of continued development, it is now in a post-industrialisation era. · Per capita GDP of UK is about 36,000 US dollars. · In China it is only 5400 US dollars. That is nearly one seventh of the UK. · Last year the urbanisation rate in China passed 50% for the first time. · Britain already reached this level in 1851, 160 years earlier than China. The UK current urbanization rate is 89%. If there is to be strong mutual respect and trust in China-UK relations we must recognise the different realities in our countries. Second, we should respect each other's choice of development path. Britain's constitutional monarchy and capitalism are the accepted choice of British people. These government and economic systems have evolved through dozens of generations spanning hundreds of years. Likewise, the socialism with Chinese characteristics in China is the accepted choice of Chinese people. It is the result of Chinese people's explorations and practices over more than one hundred years. China's development path suits China's national conditions. Its domestic agenda stresses development. Its foreign policy aims at cooperation. This is a new path for the rise of China to take its place amongst the family of world nations. China itself will never criticise the choice of development path of other countries. Likewise, China hopes other countries will respect Chinese people's own choice as well. Third, we should respect each other's core interests. In China-UK relations, core interests are our respective policy 'redlines' that shall not be crossed. 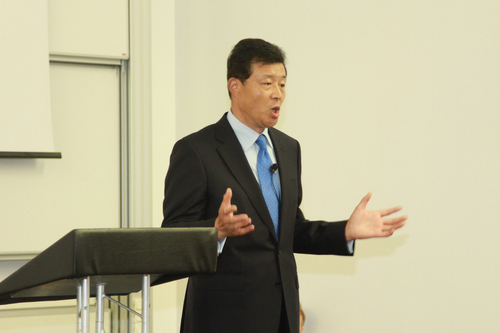 · And China will not impede Britain's economic and social development. Doesn't mutual respect mean that Britain should treat China the same way? Fourth, China's comprehensive progress should be respected. China's reform and opening up lifted one sixth of the world's population out of poverty. This is not only an achievement of China. It is also a tremendous contribution China has made to the whole world. · China has improved the People's Congress system. · China abolished the life tenure of leadership positions. · China advanced democracy among Communist Party members. · China expanded democracy at grassroots level. · China upholds the rule of law. · China respects and protects human rights. · China has built and improved social security system. All these are China's comprehensive reform measures. They show the progress we have made on all fronts. They are also the institutional drivers of China's economic growth. At the same time, we must not forget that reform is a gradual process. It takes time. Britain did not come where it is in three decades. That process took centuries. In a developing country like China, no one can get everything in the right place at one stroke. There will be problems and difficulties of many different kinds. They are 'growing pains'. They are problems that all countries will cross in their reforms. However, China is confident that it will keep reform moving forward and make further advances on all fronts of comprehensive reform. Now, let me turn to the second principle for a successful China-UK relationship. That is economic win-win. China and UK are respectively the second and seventh largest economies in the world. · The UK is a leader in new and high technology, finance, branding and creative industries. · China has a large labour force, a strong real economy, adequate capital and a huge market. · China-UK economic cooperation in recent years has grown rapidly. · In the past two years, UK exports to China increased at a rate of over 20%. · China's direct investment in Britain last year alone passed the total of all previous years. · From January to April this year, China's investment in UK was already more than three times of last year's total. Yet given our economic strengths and sizes, great potential remains untapped. I will highlight the opportunities with this dramatic comparison. As we know, the population of Ireland is 4.5 million, while China has 1.3 billion people. However, Britain's exports to China last year were only half of its exports to Ireland. First, we need to be clear that we are economic partners, not competitors. 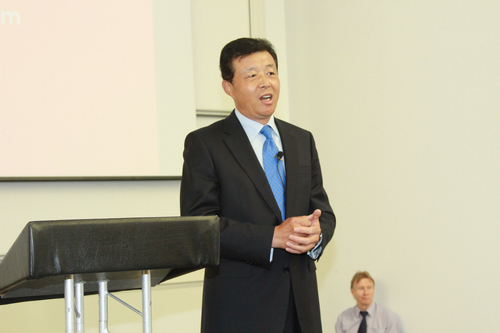 Sustained growth of the Chinese economy and economic recovery of Britain are critical to each other. Our interests are so closely linked that if one wins, both will win; one loses, both will be losers. Britain should discard the "cold war" mentality and relax restrictions on high-tech exports to China. It is now the fifth largest high-tech exporter to China among EU members (after Germany, France, Italy and Sweden). It should aim for a higher place. Second, we need to seize opportunities. China is shifting its growth model, restructuring its economy and boosting consumption. These measures mean opportunities to British businesses. Britain is reviving its manufacturing sector, upgrading infrastructure and seeking foreign investment. These also offer opportunities to Chinese companies. Both sides must not miss out the opportunities. Now, I would like to discuss the third principle for China-UK relationship. That is cultural mutual understanding and learning. China and UK are at two ends of the Eurasia continent. Chinese civilization is the world's longest continuous civilisation. The UK is a pioneer of modern civilisation. This British status arose from its lead with industrialisation over the past three centuries. So both China and Britain have made outstanding contributions to human civilisation. Cultural exchange between China and Britain dates back a long time. But the process is uneven and unbalanced in two aspects. First, China's understanding of Britain is far better than the other way round. There is a deficit of understanding on the British side. In the recent century, China has been learning from the West. What we learned includes Marxism and market economy theories. Today, Chinese children start to learn English when they are first graders or even in kindergartens. Every year, tens of thousands of Chinese students come to study in Britain. British films, TV series and musicals are immensely popular in China. For example, The Chinese version of Mamma Mia is a blockbuster. Downton Abbey is also a great hit in China. But I am afraid many ordinary British people's knowledge about China stops at martial arts. Second, there is a discrepancy in Britain's knowledge about China and its understanding of modern China. Take Durham as an example. Durham's departments of history and archeology rank very high in UK. Durham also has a long tradition of Chinese studies. Its Oriental Museum has a collection of around ten thousand pieces of Chinese antiques. Britain has many experts on Chinese antiquities. That is an excellent strength. But what about the study of today's China? Britain lacks comparable abilities with contemporary Chinese studies. There is an absence of famous scholars of modern China. In addition, some scholars are still not comfortable to see China as it is. I am glad that the cultural exchange situation is improving. More and more quality cultural products from China have been introduced to Britain. Chinese cultural performances have been well received wherever they appear. These range from the Edinburgh Arts Festival to the Royal Albert Hall, and from Shakespeare's Globe Theatre to Trafalgar Square. Through cooperation between our two countries, more than 20 Confucius institutes and 63 Confucius classrooms have been opened in UK. Over 600 middle and primary schools around UK now offer Chinese language course. · Oxford University has put together all its Chinese studies agencies and set up a China Centre. 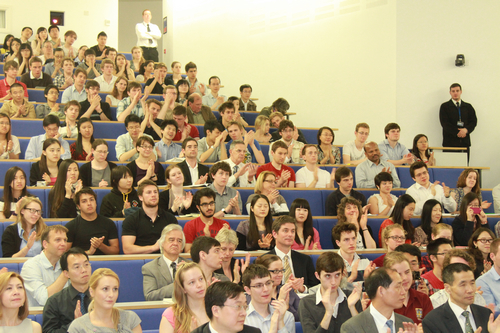 · University of London King's College opened a Chinese Studies Centre in 2010. I attended the launch ceremony. 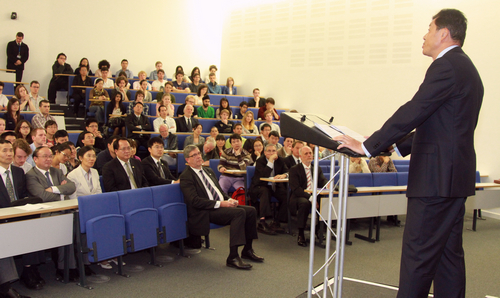 · This year, Cambridge University created a new chair of China Development in its Centre of Development Studies. 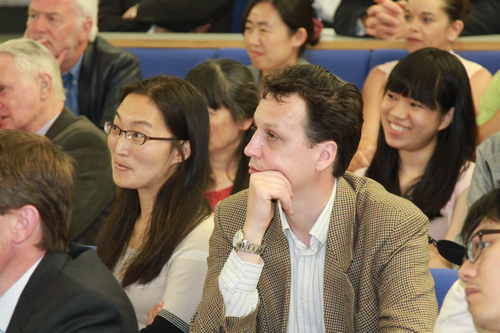 · Nottingham University's School of Contemporary Chinese Studies has earned much credit in recent years. Later this year, I will attend the launch of its new building. 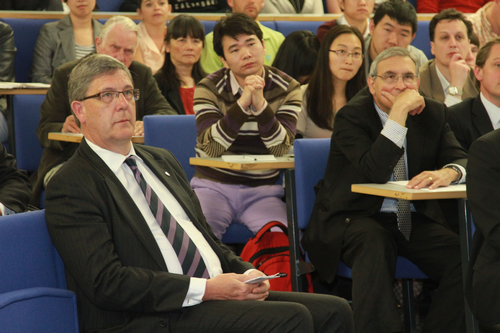 · I am delighted that Durham University has not only resumed Chinese major for undergraduates. Also, its Centre for Contemporary Chinese Studies has attracted wider attention. · British people will gain a better understanding of contemporary Chinese culture. Young Britons have greater interest in learning Chinese language and culture. · There are more academic institutions focusing on Chinese studies. · Understanding and discovering China is becoming a major trend. · Cultural exchange and mutual learning is gaining momentum. · This is precisely the purpose of the China-UK high-level people-to-people dialogue launched April this year. I hope and believe that people-to-people dialogue and cultural exchanges will become another pillar in our bilateral relations. Now, I will move on to the fourth principle governing China-UK relations. I believe a successful China-UK relationship must have mutual support and cooperation at a global level. · Climate change and infectious diseases. The combination of these conventional and non-conventional security threats makes the world everything but tranquil. The world today is still haunted by economic recession. l The US economy is sluggish. l The Euro debt crisis is worsening. l Emerging and developing economies are confronted by challenges. l Maintaining economic growth is a common and urgent task facing all countries. These issues place immense responsibility on world leaders and forums where they meet. So, China and UK should work together to uphold world peace and stability. Only a collective response to global security challenges can advance the cause of peace for all of mankind. · Protectionism is staging a coming back. · WTO negotiations are in a stalemate. · Financial systems are unstable – especially in Europe. All these challenges offer a compelling case for close collaboration between China and UK. Our shared goal is to advance reform in world economic governance and financial regulation, and safeguard the order of free and fair trade. China and UK should work together for preserving diversity in the world. History and experience proves that there is no one-size-fits-all model. This means China and UK should both advocate equal dialogue among different civilizations. Both our countries should encourage mutual learning between different social systems and development models. China-UK relationship is not only about two countries. It is also about two peoples. To promote a China-UK relationship of mutual respect, mutual benefit, mutual learning and mutual support is not only the mission of Chinese and British leaders and diplomats, but also the responsibility of all social sectors in both countries, all of you included. 'Shaped by the past, creating the future'. Let this motto also be our constant guide for the China-UK relationship.